and many other intelligent uses of foods and therapeutic plants -- nature's own medicine -- to alleviate discomforts. Best of all, this invaluable reference stresses and approach that helps you teach you children the benefits of proventing illness -- not just treating it. Today, according to the esteemed Journal of the American Medical Association, a full 42% of Americans have used natural healing therapies. To me, this is extremely good news because this was not always the case! Although it was nearly 20 years ago, I vividly recall the afternoon I nervously gave my first talk on herbs to the local PTA. Even though I was among friends in a progressive community, I had no idea how they would react to my unconventional presentation on the healing power of herbs for children. This was long before the popularity of Dr. Andrew Weil, organic foods, and the acknowledgment of the mind/body healing connection by the medical establishment. Keep in mind that until recently, "alternative" meant odd, and in many places in this country sprinkling sprouts on a salad was considered absolutely anti-establishment! I was a mother of two sons and played an active role in the life of my town, so I felt people were willing to listen to what I had to say. My audience turned out to be receptive (albeit cautious) and I was encouraged to move forward with what was to become my life's work: sharing my knowledge of the healing power of herbs -- at first with family and friends, then with clients -- and now, with you. Though I was devoted to my subject, I could hardly have known, as I gave that brief speech, that two decades later I would be writing a book on natural healing. But spreading the word about healing herbs is, after all, the most rewarding aspect of my work. I believe, as do many parents, that in addition to a repertoire of remedies that helps the body heal itself, the natural approach to wellness helps engage our young to be involved in their own health care, offering a level of understanding that will stay with them for their entire lives. They learn that taking care of their bodies preventatively is every bit as important as consulting a doctor when they are sick. America's surge in interest for natural therapies to complement, and sometimes even replace, conventional medical treatment has been reflected in, as well as driven by, mainstream media. As a result, educational opportunities in the field of holistic health care have blossomed. Even our most respected medical schools are adding studies in natural therapies to their curricula. Think back to the 1970s, when massage was noted for its sexual connotations. Now it's a reimbursable medical expense under many health-care plans. I could not have imagined twenty years ago that The New York Times would have run a piece on "alternative medicine" and was delighted when they wrote about me and herbal remedies. In the sixties and seventies, my father's losing battle with heart disease fostered my interest in alternative healing options. I have always believed in the adage "Seek and ye shall find," and that's precisely what I did. I was surprised to discover that natural healing therapies never went out of style in Europe and, in fact, that they have long been the primary modality of healing throughout much of the world. According to the World Health Organization, over 80% of the world uses herbs for healing! My undergraduate work focused on speech pathology for children. Throughout the years, as an early childhood teacher, and mother of two sons, I continued to be actively involved with children. Positive feedback is great for building one's confidence, so after years of informally sharing my herbal remedies with friends and family, I followed my heart's desire and formalized my studies in herbology. Four years of study, in addition to field work and apprenticeships helped me to attain the level of Master Herbalist. I was privileged to be mentored in the work of the late Dr. John R. Christopher, one of the most respected authors and practitioners of natural health care in this country. Dr. Christopher lovingly shared his botanical formulas with the world, and, in the spirit of carrying on his tradition, I gladly share them with you in the chapters to follow. Three days: If you are dealing with an acute situation, expect it to be turned around within three days or seek medical help. Three weeks: For a gentle program of internal cleansing of organs, allow three weeks. Three months: To reverse a long-standing, chronic condition, create a three-month focus of healing therapies and lifestyle changes for your child. All of the remedies presented here are perfectly safe, and are the result of years of experience with clients and, of course, my own sons, Chris and Brian. Best of all, incorporating these remedies into your children's lifestyles will teach them how important it is to be in charge of their own health, and the gift of health is, indeed, one of the greatest blessings of all. As a Master Herbalist, I consider it an honor to be able to share over 25 years of experience with you, and to gently introduce you to the healing power of herbs. 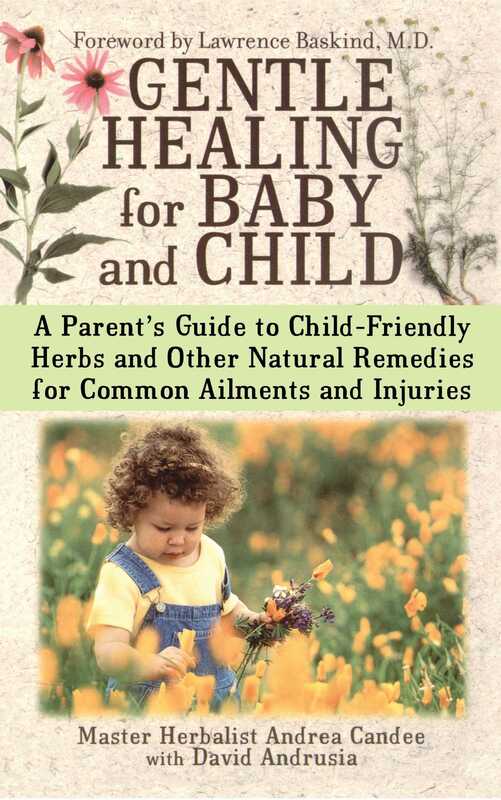 May this book be the cornerstone of your children's excellent health and wellness now, and for the rest of their lives. Andrea Candee, M.H., M.S.C., is a master herbalist with a consultation practice in Westchester County, New York. She lectures at the New York Botanical Garden and throughout the country on how to use nature's pharmacy for regaining health and maintaining wellness. She consults with physicians and other health-care practitioners, designing protocols of botanical medicine for their patients. She has been featured in many publications, including the New York Times, Self, and New Woman, and has made numerous television and radio appearances.